Kitchen cabinets can easily make or break the look of your kitchen. And while kitchens are not always the best looking of all the rooms in the house, it needs to look good nonetheless. It should be warm and inviting enough for an occasional meal. Besides, who wants to spend time cooking in a ugly looking kitchen. So to enhance the looks of your kitchen you need to ensure that you pay careful attention to the cabinets. Why are assembled kitchen cabinets popular? With our life getting busier every day, we really want every thing fast… and that applied to kitchen cabinets too. So, a lot of people consider it a sensible idea to get assembled kitchen cabinets (instead of getting ready-to-assemble or custom-made kitchen cabinets). So, the trend of assembled kitchen cabinets has really caught up in the last few years; so much so that many shops only stock these. They are not a bother because you know what exactly you will get (you can see them before your eyes); and they are easy on the pocket. These new age cabinets can give competition to even custom-made cabinets in terms of quality. They club good looks with affordable pricing so you will not have to shell out a fortune to add a dash to your kitchen. These ready-made kitchen cabinets come equipped with all the required accessories so you never have to worry about compromising on functionality. Since warehouses all over store these assembled cabinets, availability is never a problem. They can be purchased in much lesser time than what cabinets usually take to get made. Shipping time is all you need to get your dream kitchen. So no sweating over for weeks with the carpenter over designs and styles. 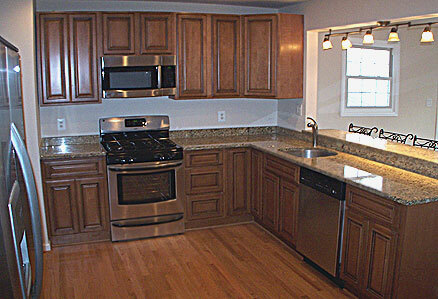 Ready-made kitchen cabinets are a boon for all the working people. There is never any time to do any household chores and you definitely do not want to spend your only holiday fixing up cabinets in your kitchen when you could be out with your friends partying. So do not put off the kitchen renovation just by the thought of all the work. Head to the nearest store and order the pre-assembled kitchen cabinets. They will be delivered at your doorstep usually within two weeks (or maybe immediately if they are in stock) and viola your kitchen is ready. You will not need to even call the carpenter! Imagine a whole new feel to your kitchen without any messy woodwork or carpenter woes. This is most definitely the best reason for you to get assembled kitchen cabinets over all other kinds. Since there is hardly any work involved after ordering, you can make things easier by ordering the assembled kitchen cabinets online. All styles are available so all your cabinets are now just a click away. Just log on, go through the large variety on offer, pick the styles that suit your needs, check the dimensions and order them right there and then. However, if you need to see and feel the pre-assembled kitchen cabinets before you buy them, you will need to go to one of the big furniture stores that stock a large variety of kitchen cabinetry to get the first-hand experience. These assembled kitchen cabinets must not be chosen merely to enhance the look of your kitchen but most importantly for their high functionality. They will single-handedly take care of all your storage needs if you make the right choice. With the ever increasing importance of quality kitchens in houses, such assembled cupboards serve both utilitarian as well as decorative functions. In fact they are a good investment to make while remodeling your kitchen. So do not lose heart if your kitchen cabinets are not up to your liking. Just choose out of the plethora of assembled kitchen cabinet options available in the market and get yourself one! Great post about assembled kitchen cabinets, I’m waiting for the next one! Thanks for your valuable information on assembled kitchen cabinets… it was quite interesting. One of the biggest drawbacks of online kitchen cabinets is that they are RTA or ready-to-assemble cabinets. So you save a ton of money but you end up spending days assembling them. One company that is different is Four Less Cabinets. They ship cabinets fully assembled and ready to install. Their prices are great and they have a low price guarantee. In addition, they carry a great line of replacement doors for refacing. Simply go online and visit them at http://www.fourlersscabinets.com or call them at 631-412-7193. Ordering online is OK if the homeowner knows what they are doing. There is a lot more to it than ordering some boxes.